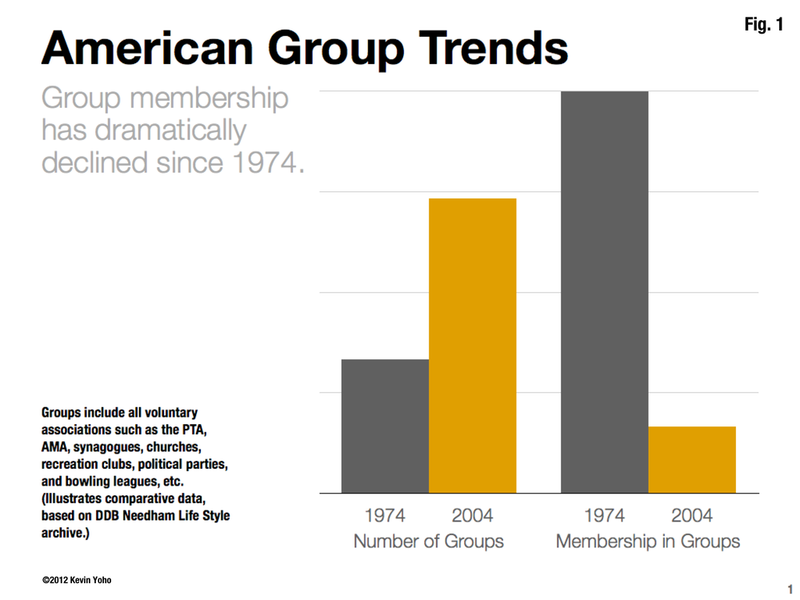 American Group Trends, (Fig. 1, see below), visualizes two radical changes in American life. First, compared to 1974, there were more than twice the number of groups, and second, an approximate twenty percent decline in total group membership as well twenty-five percent fewer people in the new groups. More groups with fewer members suggest that Americans join less. In Volunteer Trends, (Fig. 2, see below), denominational data is overlaid with the aggregate membership of all volunteer associations. Though the scale varies, the trend is remarkably similar. One assumption we could test about the data is to hypothesize that the cause of the church’s decline correlates to the decline in other volunteer groups. Fig. 2 - Volunteer Trends.